I have to give thanks to my parents and my uncles for making me love nature and be an adventurer at heart. And I also have to give thanks to my friends Kate and Reed for organizing the trip to the best park I’ve visited in a long time. The Monday of the Chinese national holiday, the Autumn Festival, we embarked on a twenty-four-hour train to the Hunan province, on the south of China. 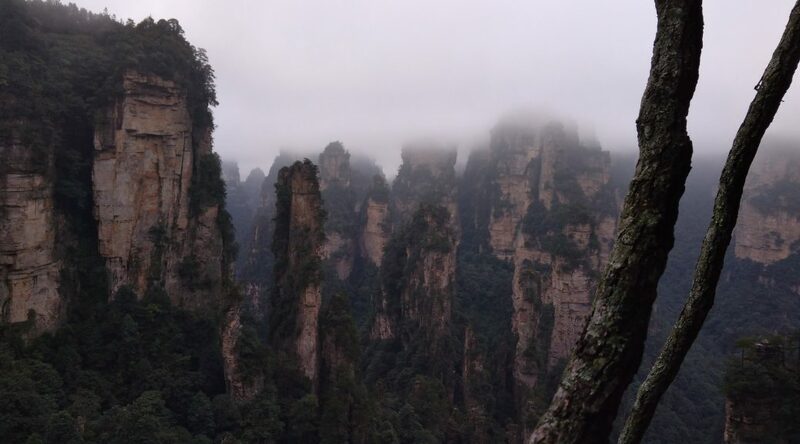 Fortunately, we bought the train tickets with enough time to get beds during the ride and we were able to sleep for most of it until we arrived at Zhangjiajie, the city in Hunan where we stayed. Have already taken four overnight trains during our excursion along the Silk Road, we consider ourselves train experts. And we were very well prepared, with ramen, peanut butter and Nutella sandwiches and a lot of movies, among them Avatar, shot in the park we were going to visit. After the train trip, we made it to the hostel craving to eat real food and take a shower. The hostel was we stayed was full of international students and close to a lot of local restaurants and bars. We dined like kings. 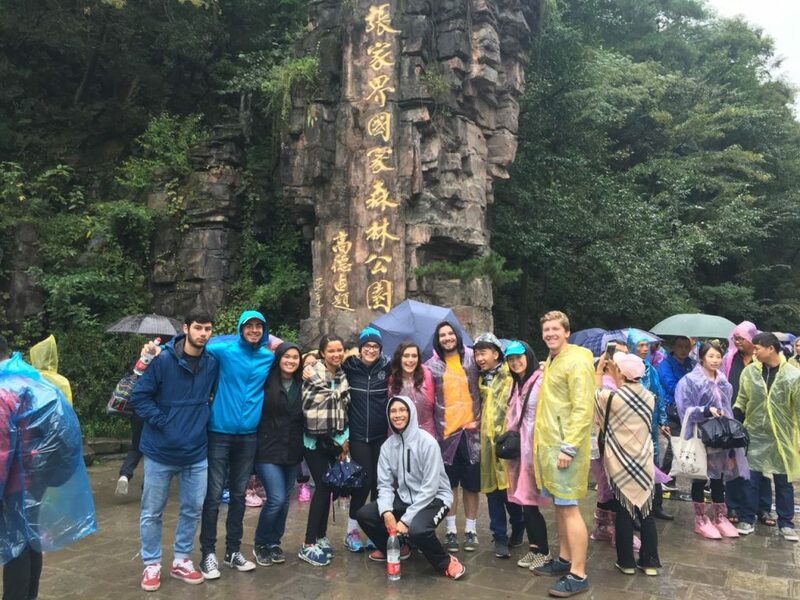 Our friend Lenny, born and raised in the Hunan province, showed us the best traditional food of the area. That night, we also explored the city and bought traditional Chinese mooncakes. 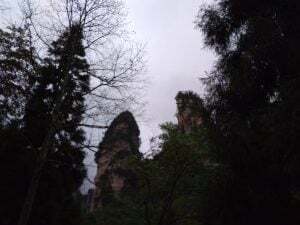 The next day we visited Tianzi mountain, a popular attraction in the Wunlingyuan park. Without noticing and with a lot of strength, we climbed the mountain, our legs begging us to rest and the fog surrounding us. It took us around two hours, but getting to the top of the mountain was worth it. It felt like we were in a movie; the fog embracing us and not letting us see beyond our arms, but we loved the feeling of having made it and touching the highest rocks in the park. My friends almost cried with happiness while eating McDonald’s at the top of the mountain, but I was shocked seeing how far junk food has gotten, to the top of a mountain of one of the most beautiful parks in the world! We didn’t have the energy to walk down the mountain, so we got on a cable car and flew between the mountains, expecting to see the creatures from Avatar fly alongside us. Although I’m terrified of hights, I was able to survive the ride on the cable car. And it was so worth it. Our hostel was in a city about an hour away from the park, so we took a bus back, where we all fell asleep. When we got back to the city of Zhangjiajie, where we were staying, we discovered a small restaurant next to our hostel and we ate there every single day, enjoying the best fried rice we’ve ever had. The next day we walked in nature some more, but this time downhill. We took another cable car to the top of a different mountain and saw more fog, beautiful mountains and took a lot of pictures. We walked up a very high peak (I was very scared), we screamed to hear the echo rumble and did more exercise that we had done in weeks. And telling each other stories we hadn’t heard already we started walking downhill, this time our knees suffering. The way down was hard but rewarded by another delicious dinner and a night exploring the nightlife of the city. Time flew by. And by the third day, I thought we had seen everything. We rode the fastest glass elevator in the world all the way to the top of yet another different mountain. It was a little disappointing because we couldn’t see much due to the amount of people in the elevator. But when we reached the top we had the best view of the whole three days and amazing noodles and roasted walnuts made by locals. 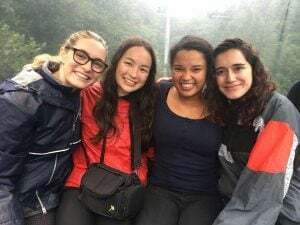 We met another group of American students, one of us jumped in a lake after losing a bet, we saw rivers, and monkeys in their natural habitat, we had honey on a stick when we reached the valley of the mountain and we made memories that will be with us forever. Another memory that is going to last us a lifetime is the one of the ride back to Beijing on a train that lasted almost thirty hours. We didn’t have beds this time, and I slept around two hours, with my head on a small table where three of my friends were also laying their heads. Being the way I am, I finished two books; and being the way we are, we watched three to four movies. And we ate more Nutella and peanut butter sandwiches. It was a very long ride. We spent the last four hours with people really close to us standing in the aisles. It was definitely an interesting experience. But it wasn’t horrible because we were a good group of people; we all got along very well and were organized well. I couldn’t have chosen a better group of people to travel with. I know this wasn’t my last trip outside of Beijing, but it will certainly be one of the best. And the most beautiful.